Hello Zoë, thanks for submitting your work. Can you tell us a little bit about yourself? Thank you for this opportunity to share my work. I am currently in my final year of studying Fine Art at Chelsea College of Arts in London, which I love. The last few years of studying have been life changing and I have been able to find my voice, after years of anxiety. I am originally from Brighton and I am also half French. I have always been creative, which was encouraged at the Waldorf Steiner School I attended throughout my childhood. After I graduate I plan to become a practicing artist and I hope to have a creative career. I have been working with photography for a few years, in the past to document installations and create self-portraits, but it was not a serious part of my practice until I discovered infrared photography. It has now grown into a passion to learn how to work with the medium from digital to film photography. When I first saw Richard Mosse’s images I was overcome with a need to use this infrared, and since then I have approached it from many angles. It wasn’t until then that I truly connected with photography, and it has now become my main focus. You are studying fine art at the famous Chelsea College of Arts in London. What is the most important thing that you have learnt about fine art photography during your studies? Because I am studying Fine Art it has been a liberating experience as there has been less focus on technique and more focus on ideas and inspirations for my photographs. I was supported in my slow journey to learning how to work with different cameras and the editing process involved with infrared, and I have been able to approach it in less serious manner. Because of the wide range of facilities I have been able to consider how I want my work to be displayed by building my own light boxes and printing on textiles. Therefore for me the most important part of fine art photography is the context of the work. During your studies your practice has involved exploring the color pink in different mediums and themes. It seems that this had a deep influence in your work? Pink has been a primary theme throughout my work for many years. Originating from an exploration of feminist ideas around reclaiming the colour from its many negative stereotypes in connection to femininity and ‘girlyness’. Pink is one of the least used colours within art, and I am interested in why that is and what meanings it triggers in people. I have found people have strong opinions or reactions to pink, and I enjoy this affect. It started as a reaction, with a need to examine the cause of why pink had such strong associations, and why I felt ashamed of liking it. Yet overtime I became obsessed with pink and I have since explored it in many ways. It has grown much bigger then its stereotypes, for me it has become a way to express myself. Pink has become part of my artistic persona ‘Mz Pink’ which I use to help me overcome my anxiety; I am able to be confident because pink makes me feel empowered. My work has used pink conceptually and also purely as a colour, there has been no limit to how I have used it. I feel with every project I have found something new to say with it, and it has evolved overtime. Let’s talk about your submitted landscape photographs. First of all congratulation for theses unique compositions! The images are kind of a pink dreamlike world. How did you come up with the idea? Through my explorations of pink I wanted to be able to create a utopia of some sorts, a pink dreamscape. Pink for me is a calm colour and I wanted to create a space void from reality, and the harshness of life. I am pulled towards the idea of creating immersive images that can envelop the viewer, creating an alternative universe. The subconscious aesthetics of pink play an important role in these images, and I am interested in the automatic responses to the colour from the audience. I have become fascinated by nature, in finding a way to transition my ideas around pink to a surreal and natural space. A way to discover the abilities of pink to change a subject and separate it from its associations. 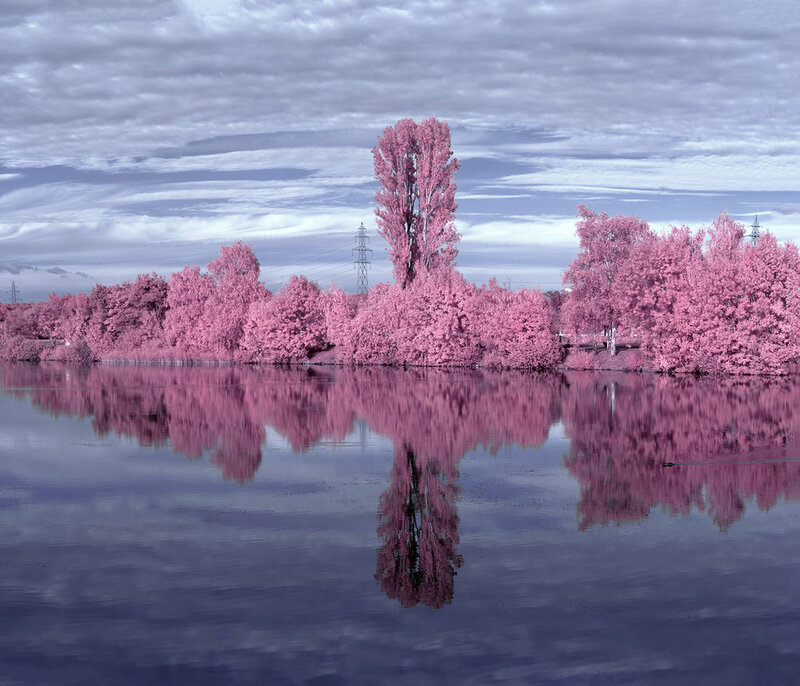 Nature is an important part of infrared photography because it is the green that becomes pink. Therefore I have been documenting every walk in the countryside, in the hope of finding a vast beautiful landscape. 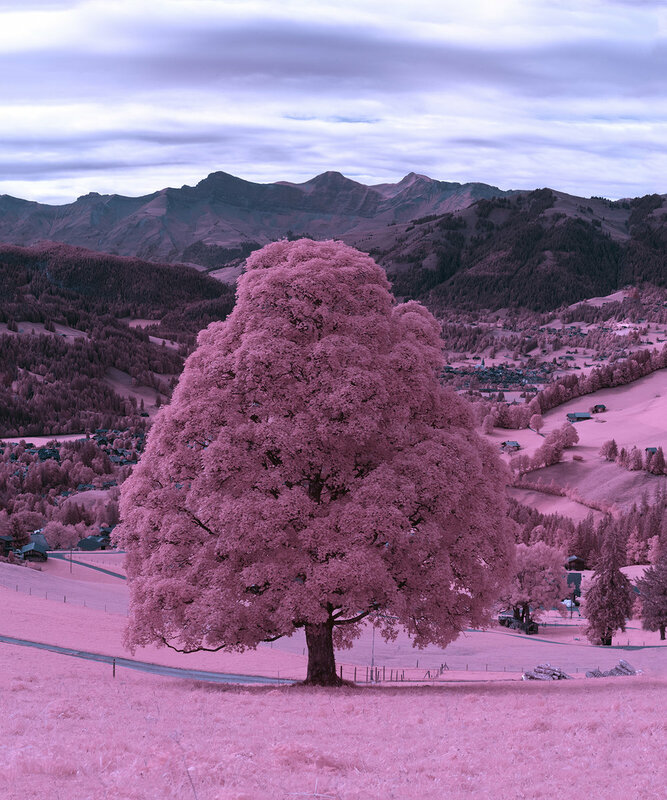 You used digital infrared photography. Do you think digital photography gives you more possibilities to express your art? With this series I found using digital photography gave me the possibility to capture vast landscapes in panoramic shots. My converted camera is actually quite low resolution so I took about 40 images for each location and stitched them together so that I could create high quality images. The process of editing my photographs afterwards is a part I have come to enjoy because each image is a surprise like with film. Digital photography has so much potential to be manipulated; and I like to enhance the artificiality of it somehow. Do you have a special workflow, when you start with a project? I tend to work in two ways, either I go out and just take pictures and I don’t think I just do, but then there is the other part where I plan an idea for a long time thinking about the way I want to do it. Is there a photographer, which has influenced your thinking and photography? 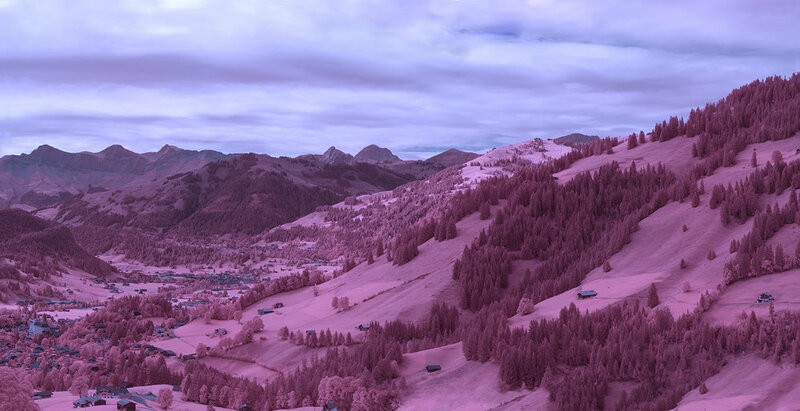 Richard Mosse has definitely influenced me by showing me this medium, but he has also made me want to reclaim the medium from such a problematic context. His beautification of war has made me want to explore why pink has this affect on serious situations, and it has motivated me to explore this medium. I have also been inspired by photographers such as Juno Calypso and Signe Pierce who have made me reconsider aesthetics and the role of beauty in photography. They both incorporate feminine stereotypes into their work, and they are also unafraid to work with pink. I feel that overtime as I gain more skills, I will move more towards film photography, hopefully large format. I want to be able to work large-scale, filling entire spaces with huge pictures. I want to work more with how my photography is presented so that they can create an entire world of their own. I also want to continue exploring the boundaries of infrared and attempt to take it somewhere new.